Town Wide Road Sweeping Begins TODAY in Redding: The Redding highway department will begin its town-wide road sweeping today, Monday, April 15, 2019. This will take approximately 2 weeks to complete and is weather dependent. Visit the Town of Redding online here for additional information. At Ridgefield Academy, we believe summer is a time for children to explore, discover, and engage in activities that bring them joy. 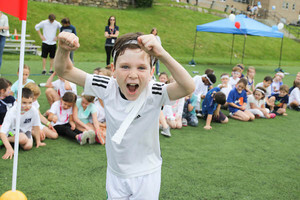 Whether it is creating through art, learning to code or honing skills in a particular sport, RA offers an enriching summer experience for every child’s imagination. Programs are tailored to children aged 2 to 14 and take place on RA’s spectacular 42-acre campus. RA’s summer programs are open to the public, begin on June 17 and run for six weeks. Camp Landmark’s 2s camp is comprised of half day programs that are sure to bring smiles to all little faces. Themed camp weeks such as Storytime, A Camping We Will Go, Stars and Stripes celebrating Independence Day, and Under the Sea will be offered. Each day will consist of free play, circle time, outside play, and a themed activity under the supervision of experienced preschool teachers. 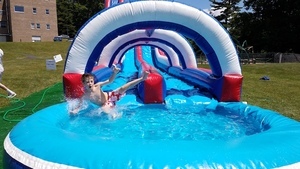 Camp Landmark also offers children ages 3 and 4 full day camp options covering a wide range of entertaining programs, including sports, cooking, camping, science and art. All programs are offered on a weekly basis. Patriot Camp is offered to children entering Kindergarten through grade 5. A series of themed weeks include Terrific Trip Week, Science Week and Survivor Camp. Also offered are two weeks of split day programs that include Sparklicious Art Studio or Cupcake Wars in the morning, followed by traditional day camp activities such as swimming, sports, cooking, science, technology, and games during the second half of the day. Returning once again this year during Week 5 is the nationally recognized Camp Invention - a STEM summer program turning curious students into innovative thinkers. For middle school students entering grades 5-8, our Explorer Programs offer a broad variety of half and full day programs. If you enjoy sports, you can register for the New York Red Bulls Soccer Program, New York NFL Alumni Hero Youth Football Camp, GameBreaker Lacrosse Camp or Revolution Field Hockey Camp. There are numerous programs in science, technology, and mathematics such as STEAM Workshop, Video Game Creation, Junior Economists, Robotics, Coding, and engineering. Campers can also sign up for a Babysitting Training/First Aid Certification. There is no shortage of workshops in the arts and cooking as Broadway Musical Theater, Cupcake Wars and photography are just a few of the many offerings available.